Dazed & Confused has always been at the forefront of innovative fashion, art and music, providing a creative platform for designers, artists and models to showcase their talents. 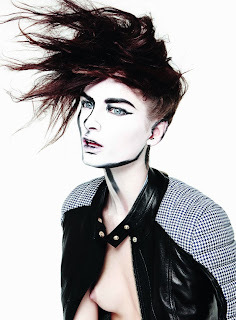 For the June 2012 issue, the worlds of fashion and art collide in an editorial shot by Daniel Jackson featuring the incredible make-up artistry of Yadim. The editorial showcases three stand out faces of the Fall/Winter 2012 collections - Ava Smith, Madison Headrick and Codie Young. Inspired by the iconic vintage Christian Dior illustrations of Italian fashion illustrator René Gruau, American make-up artist Yadim transforms the models into real life tableaux. The editorial features each model with paled out faces, black illustrative lines highlighting various angles and contours of the face, and heavily red glossed lips. The overall effect is beautifully unnerving with Smith, Headrick and Young resembling illustrations superimposed on a living person.